Vintage, Jeanette Glass Co., Louisa-Irridescent Pattern JEGLOUI, Set of Six (6) Glasses, Made in the 1940's. The "Louisa-Irridescent" Vintage Glassware Pattern by Jeanette Glass Co., made in the 1940's, is a Floragold Color (Peachy Gold) and shines Brightly. 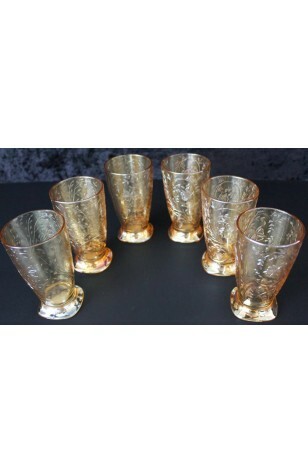 We are offering a Set of Six (6) Glasses. The Gasses are embellished with Flowers, Vines, and Leaves, all in the Floragold Color. Bottoms of the Glasses are Square Footed.